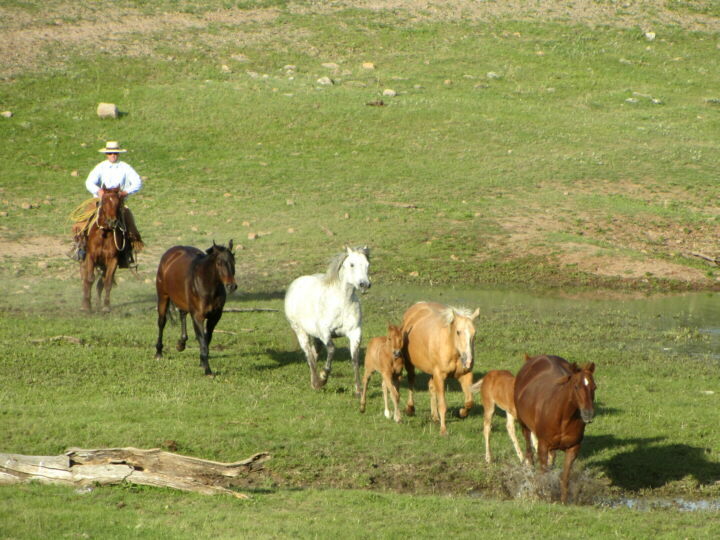 The ranch owns a remuda of thirty riding horses, most of them bred at the ranch or related to our broodmares. 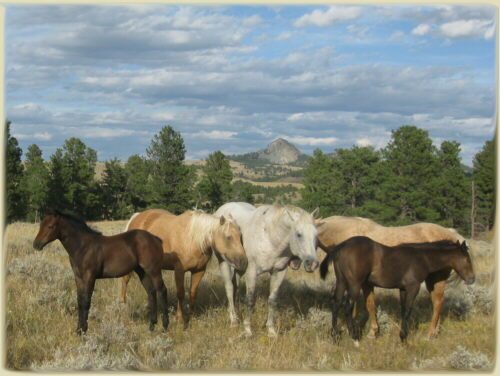 As time allows we will list some of our horses here. Please bear with us - ranch life keeps us busy away from the Computer. 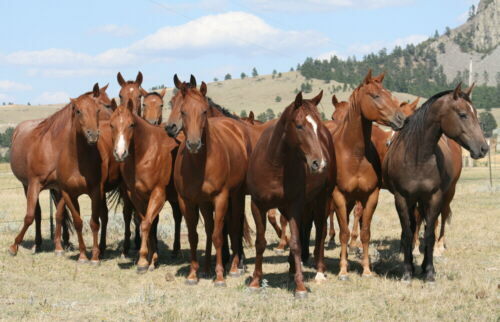 Some of these horses may come up for sale - don't hesitate to inquire. 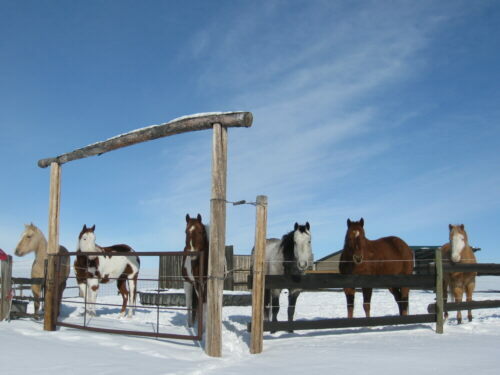 picture: Winter 2010/11: Birdy (AQHA), Freno (APHA), Mac (APHA), Smoke (AQHA), Pepone (AQHA), Hollywood (APHA) - the six-pack. The gang - 2013 weanlings Hickory With Cows aka Hicks, Plenty O Irish Miss aka Ginger, Roxy Smokey Pep aka Pep, and ST Robbin Tha King aka Trooper enjoy a sunny day in one of the coldest winters we have had in years. 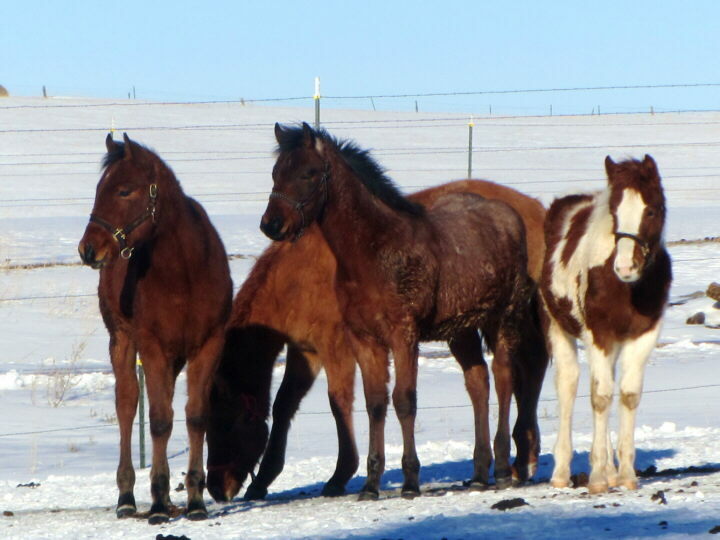 These foals take advantage of our offer to winter foals purchased from us with halter training and daily handling. 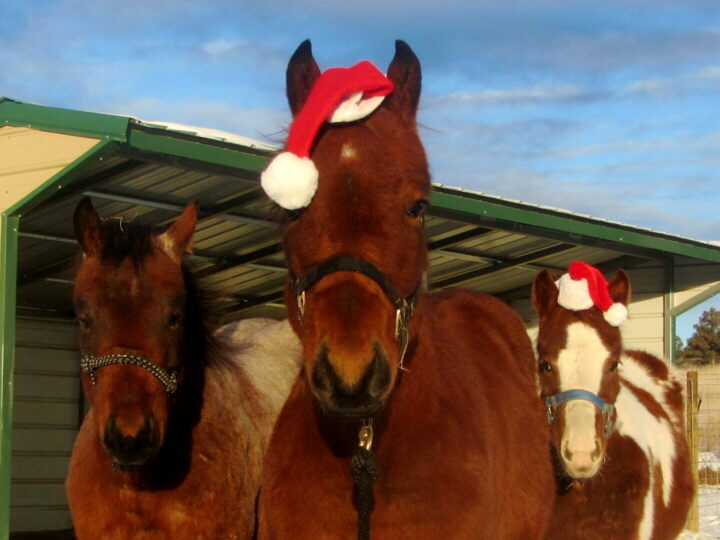 2013 weanlings Roxy Smokey Pep aka Pep, Hickory With Cows aka Hicks, and ST Robbin Tha King aka Trooper wish everybody Happy Holidays! 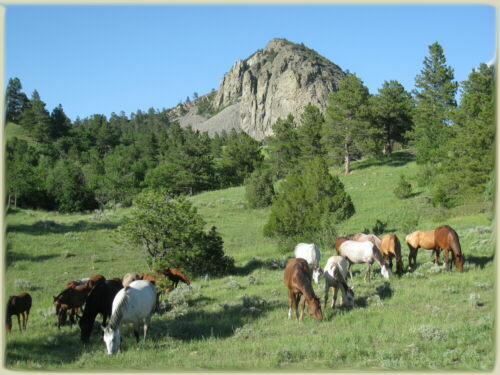 Some of our ranch remuda. 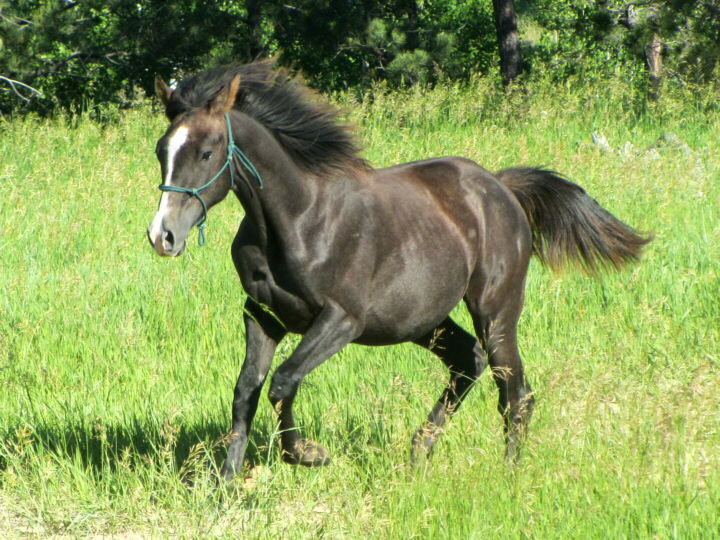 Twister, a black gelding by Midnight Bullit, a black paint stallion we, unfortunately, had to geld early on due to having too many stallions at the ranch. 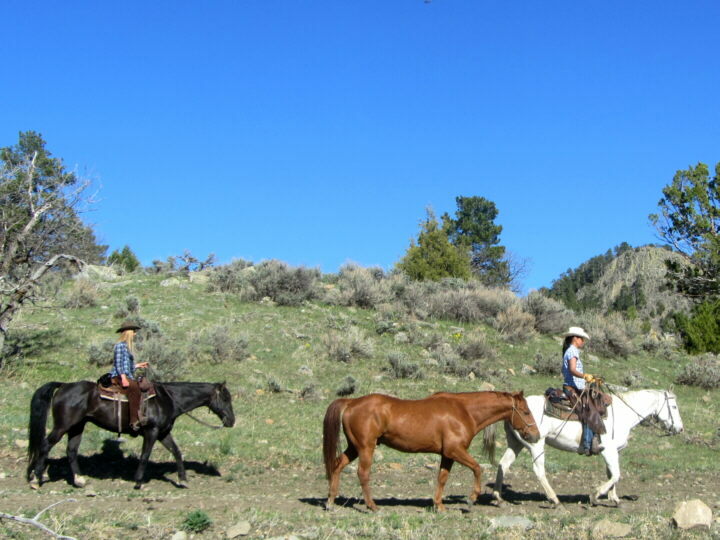 As an after thought - a big mistake, because he and his son Twister are two of the best ranch horses we own, tall build, big boned, and great dispositions. Flash, a sorrel gelding by Docs Sabre Glo, the sire of many of our good broodmares. 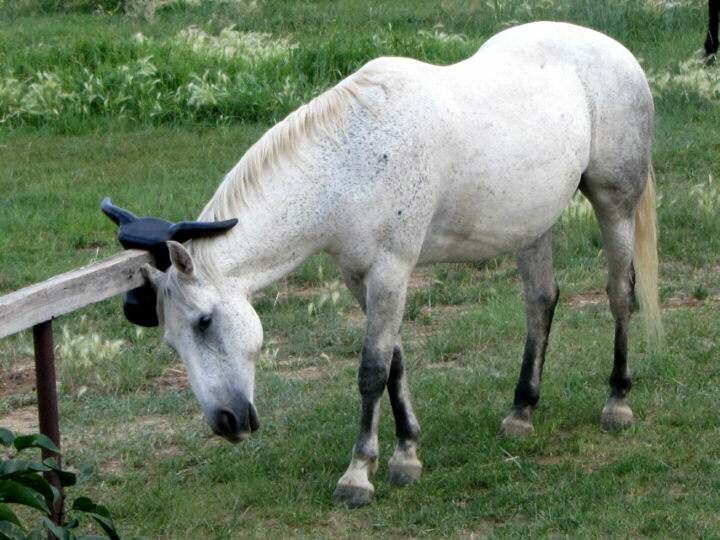 Amigo, a gray gelding by MB Smart Smokey, who can also be found in the blood lines of many of our broodmares. A hot day in July. 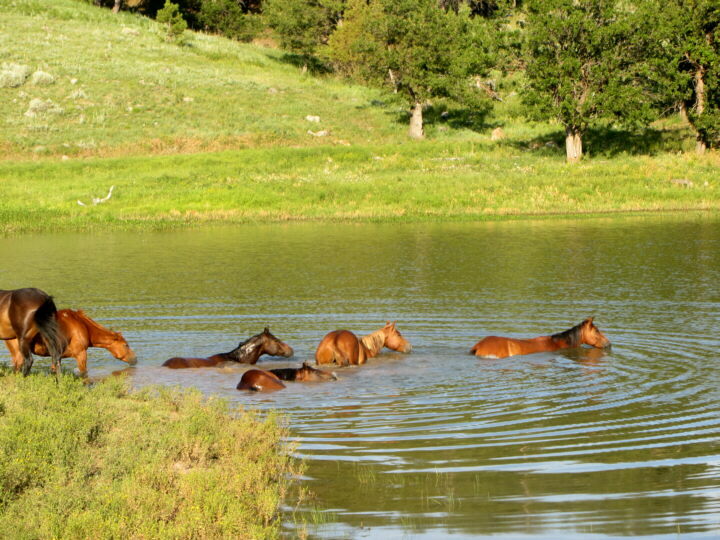 Our saddle and broodmare prospects enjoy a swim in the lake. 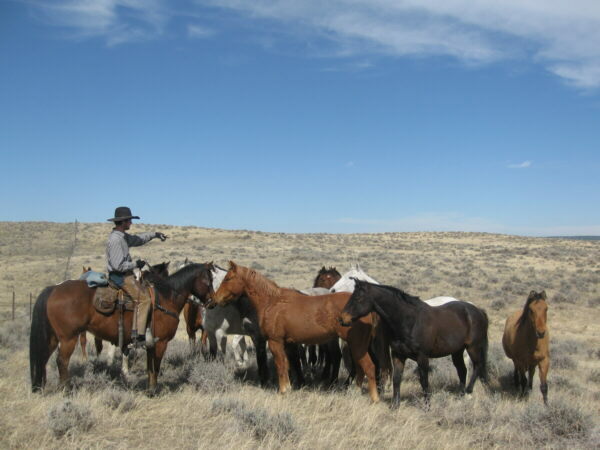 Cowboy Jake bringing some of the horses back to the ranch. Her rides Cherry, a sorrel gelding by our bay stallion Dualin With Cows. - saddle horse Whiskey, a brown gelding by Plenty O Paddys Lena. 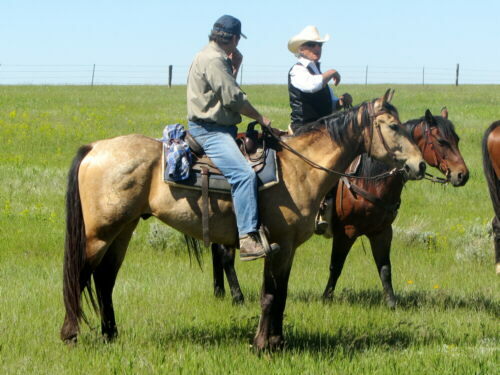 - saddle horse Pablo, a Peppy San / Utopian Wix bred gray gelding who had a very promising first foal crop but was gelded due to having too many stallions at the ranch. Truth to be hold - every good stallion makes an even better gelding when it comes to using horses. 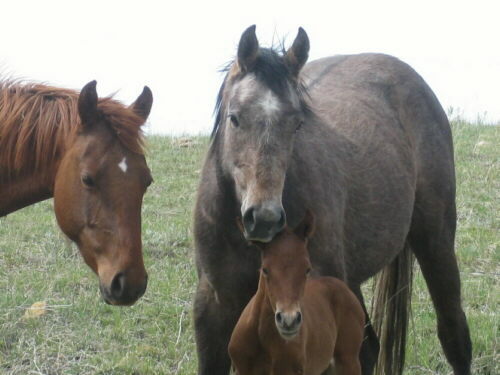 - Tee Bar Jeep with her 2013 chestnut stud colt by Dualin With Cows. Broodmares looking forward to Spring. and Ame Go Red Glo (chestnut). Our broodmare prospects, all half sisters by a Doc Olena bred stallion. Except the chestnut with the big star and snip, she slipped in this group. This is Cowgirl Up Smartie who, at least, shares a grandfather (Mr Sun O Lena) with the other mares. Silver - 2012 gray Half-Arabian stud colt. His half brother had me impressed so much with his smarts that I purchased this little guy when he came up for sale, to see if the smarts are from the sires side. They sure are! Dancer - 2008 dunskin gelding. He stands about 16 hands, sure a tall horse. He was used as a ranch horse since he was broke, working cattle, brandings, doctoring, you name it, he's done it. Most cowboys prefer a horse with a lot of go, while Dancer is more on the laid back side, not lazy but also not high strung. This is why his owner traded him in for a higher energy horse from us. 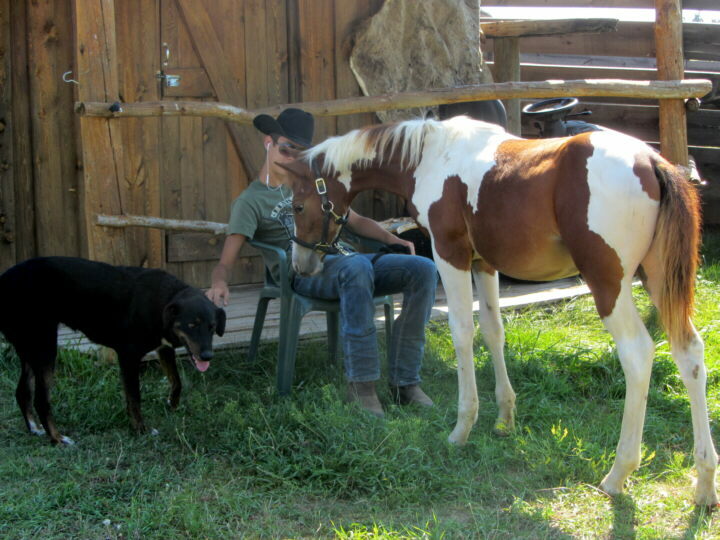 We use Dancer at the ranch, most anybody can ride him and push cows around with him. Dancer will be for sale later this fall. Picasso - smartest horse I ever worked with. He is by a purebred Arabian out of a speed bred APHA mare. Someone would think that produces a very high strung horse - wrong thinking. He is very easy to work with. Unfortunately life is getting away with us, he had a ride on him in the roundpen, but no further training (yet). 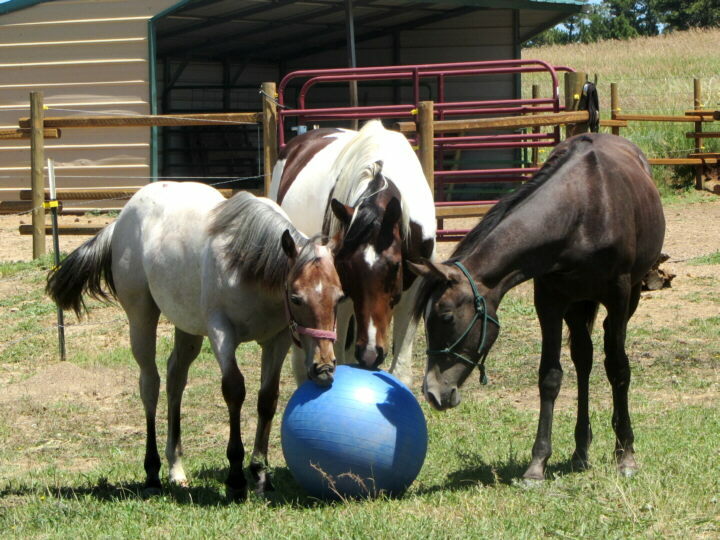 Smoking Hot Roxy (2012 AQHA filly), Picasso (2010 AHA gelding), and Silver (2012 AHA stallion) check out their new toy. The proud papa (gray) with Windy Dual Gun's 2012 filly, born May 2nd, picture taken May 3rd. 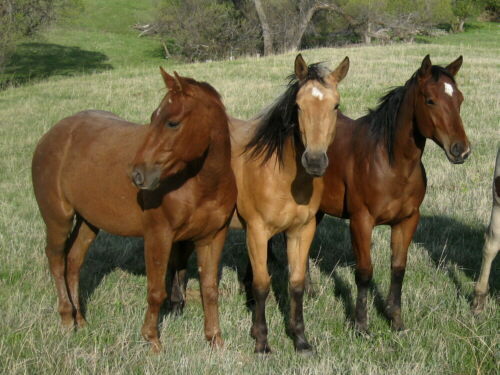 Horses in the Lake Pasture (dry broodmares and young horses). The Lake Pasture has very rough, rocky footing and teaches the young ones to become very surefooted. 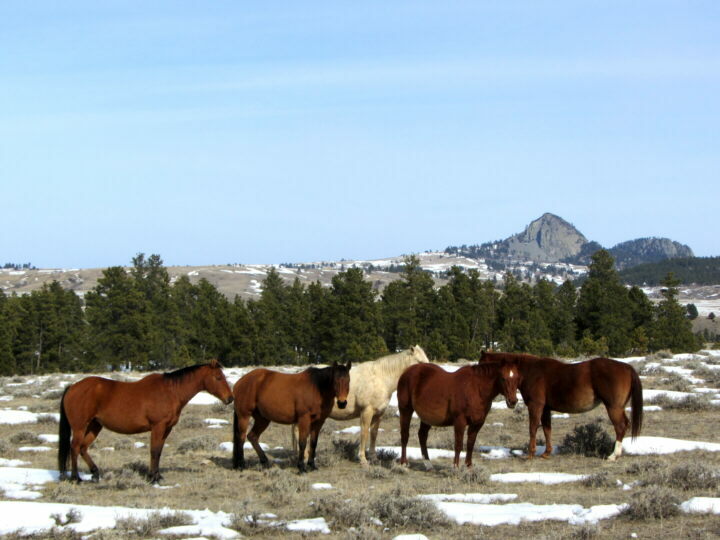 Riding horses in their winter pasture, fully visible here Red, Scrupino and Babina. Cowboy Tav makes a head count. 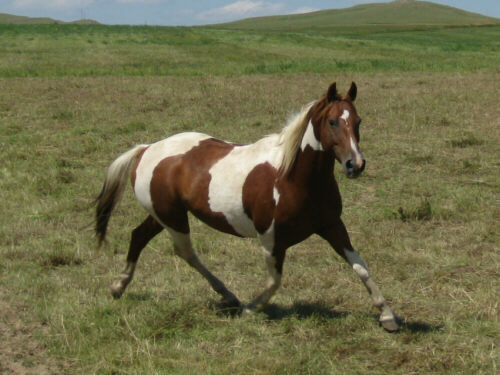 Mac - 2004 APHA gelding. He stands about 15.3 hands but looks like 17 - a huge horse with a lot of energy. He is my personal saddle horse - not the kind of horse for many riders, we have an agreement who controls whom, this agreement falls apart even if shared with experienced other riders. Foxy was a life insurance of a horse, equally great for beginners pushing cows as for cowboys getting the work done. He was the one the bottom of the pecking order in the herd, yet he was a breeding stud with his own band of mares until he was gelded as a 6year old. 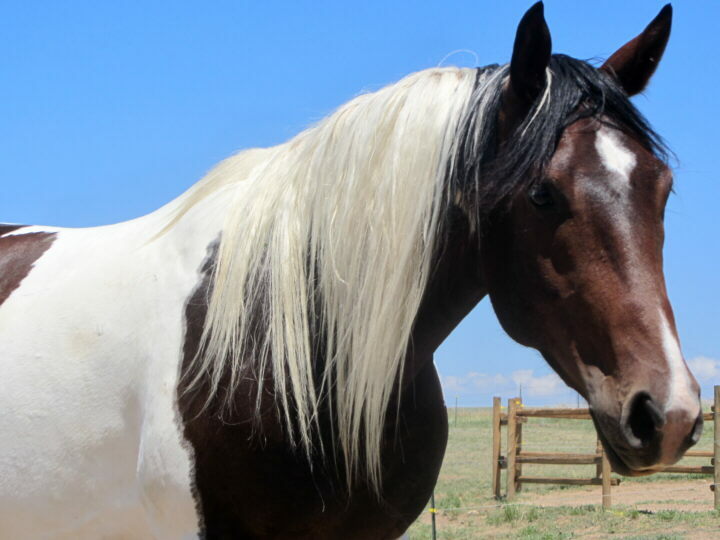 He had an accident that deformed his left eye, a cut in his ear, and his coloring was not to everybodies taste, thus he was referred to as "Heike's ugly paint" at the ranch. But when a crew of Chicago photographers came out to ask to borrow a horse for their next motorcycle calender - they picked Foxy out of a herd of twentyfive horses - go figure. Foxy passed away way too early due to colic complications.